Here is a list of the seven best pro scooters on the market right now. Each scooter received excellent overall reviews, and the list is in reverse order, ending with the top-rated model. If you want to take your scooter experience to the next level, you should consider moving up to a pro scooter. They offer better control; easier handling for tricks, plus pro scooters can attain high speeds in an instant. When you’re searching a list of the best pro scooters, you should keep the previous three features in mind. 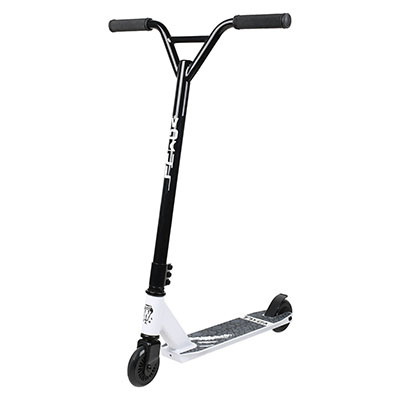 The Xspec Pro Stunt Kick Scooter has the narrowest deck width design for the most streamlined performance. This scooter uses a reinforced aluminum fork that is threaded for improved strength. There are aluminum core wheels with ABEC-7 ball bearings for a lightning fast, but a smooth ride. 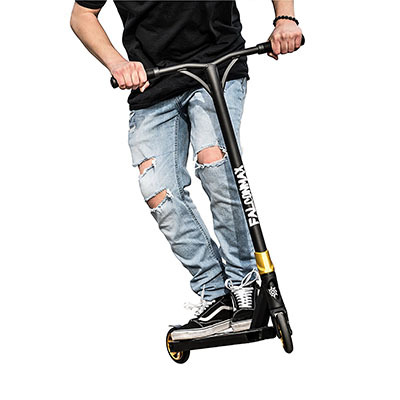 The first selection of the best pro scooters is designed to perform the trickiest stunts. It incorporates a freestyle type of BMX handlebar for precise control. 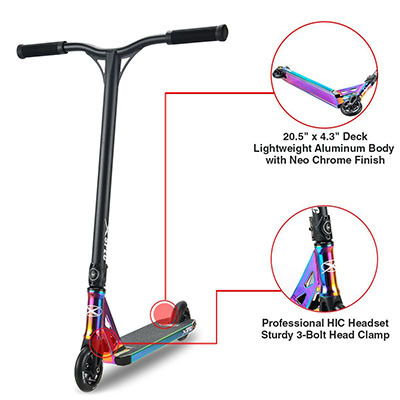 While this design serves beginners well, it is also rated to a maximum rider weight of 220 pounds, so it can handle the adult, expert scooter enthusiast. The VOKUL S2 is an exceptionally solid scooter, made using 6061-T6 aircraft aluminum. There is a reinforced deck design and an extra strong, carbon steel handlebar for enhanced safety. The wheels are heat-treated, T6 grade aircraft aluminum with sure-grip, high rebound polyurethane tires. The VOKUL S2 Tricks Pro Stunt Scooter assembly is as easy as one, two, three bolts. You’ll be ready to go in as little as five minutes. This model is an entry level freestyle design but will handle the tricks of an advanced, competitive pro scooter. 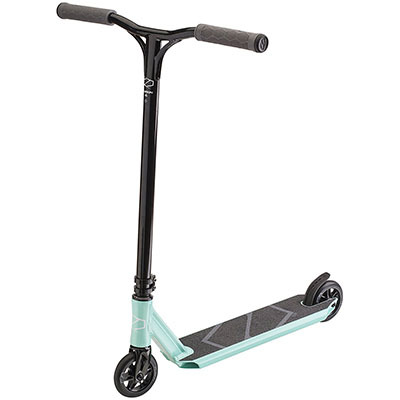 This scooter has a slightly wider and longer frame base for secure footing. There are a reinforced bar neck and extra long handlebar for improved control. The wheel cups are steel, with high-quality ball bearings. The Sanview Freestyle Pro Stunt Scooter is perfect for the expert but is also a good option for even the novice scooter enthusiast. 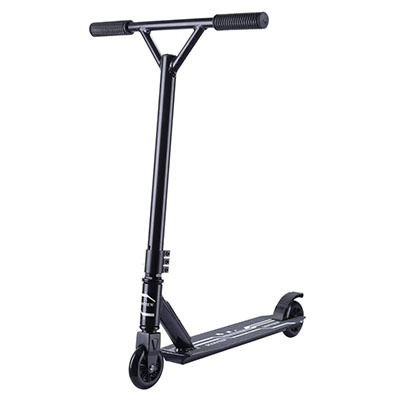 This scooter has an advanced, ABEC-9 ball bearing for excellent wheel durability. The manufacturing process uses robotic TIG welds at all joints for super strength and durability. This scooter uses a slightly titled, 82-degree head tube angle for better control. 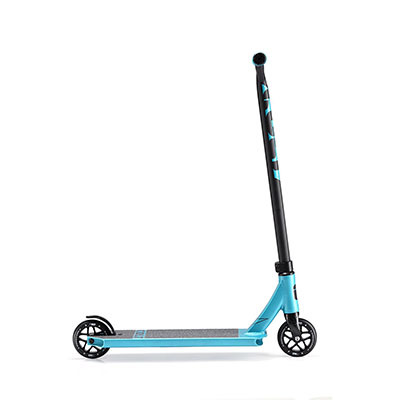 The Lucky TFOX Sig Pro Complete Freestyle Scooter has an extra-wide t-bar handle for tackling the most difficult tricks. This option in your list of the best pro scooters is a collective effort between Lucky and TFOX. These two scooter makers have produced the lightest competition-grade scooter on the market. It not only performs beyond expectations, but it’s backed by a full 180-day warranty. The wheels are 110 millimeter cast aluminum with a six-spoke design for stability. With 88A polyurethane, high rebound tires, this scooter is super fast, but will also stop on a dime. The rear brake is a nylon and steel triad brake design for safe, secure stopping. Renowned scooter manufacturer Fuzion makes the third highest rating in your list of the best pro scooters. 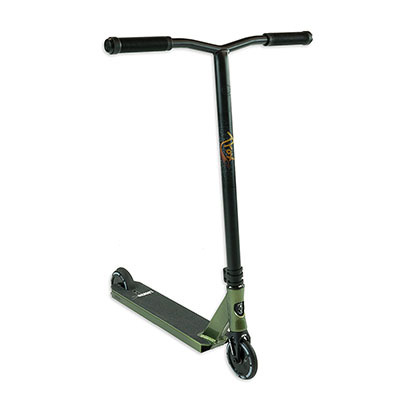 The Fuzion Z300 Pro Scooter Complete has large grips and a heavy-duty design to handle the toughest tricks. The Envy S2 has low profile wheels to help you generate excellent speed, yet maintain secure control. There is a slightly wider base to offer younger riders more secure footing. Experienced riders will find the extra lightweight frame outstanding for hard tricks. This is a perfect choice for younger or inexperienced beginners. However, the advanced scooter expert will not be lost on the excellent features of the Envy S2 Colt Freestyle Pro Scooter. It also comes in three really striking colors. High rebound polyurethane wheels are excellent for performing the most difficult tricks but still offer outstanding traction. The forks are forged aluminum, and the t-bar handlebar is chrome steel. This scooter has a patented compression system for a comfortable ride and cushioned landing on tricks. The final scooter on your list of the best pro scooters generated excellent customer ratings. The FMX Trick Scooter is lightweight but will handle any terrain. This scooter’s revolutionary design exudes raw power and exceptional handling. These are the seven best pro scooters according to the customer reviews. There are some differences in features and price, but they all earned excellent overall ratings. If you’ve ridden any of these scooters, let us know how you liked yours. In addition, if you’ve found any better pro scooters that missed the list, let us hear about those as well.